We tell ours through our fresh ingredients and our passion for the plate. Twenty-five years ago, the Milestones story began in Vancouver on Denman Street. Today, we span coast-to-coast, with locations in British Columbia, Alberta, Ontario, Newfoundland and Saskatchewan. Our exceptionally talented Executive Chef brings unexpected yet tasty twists to classics. He then gives these carefully crafted recipes to his culinary team, making sure they have perfected these creations before bringing them to you. And that's what you can always be sure of, that there's a chef in every Milestones kitchen making your plate just right. 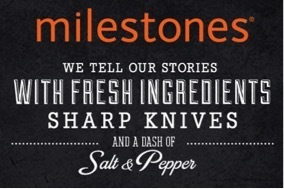 It's this passion in our recipes that makes a visit to Milestones truly unforgettable. Whether you come for a favourite meal or love trying new and trendy dishes, Milestones is all about great food without the pretension. We're an impromptu meeting place for friends and a cozy spot for date nights. We're familiar and friendly, but always on the cutting-edge. 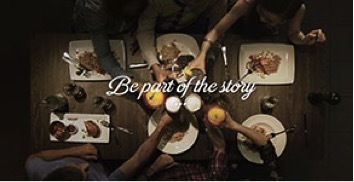 We're nights to remember and remarkable flavours to savour. That's how we set the table at Milestones.